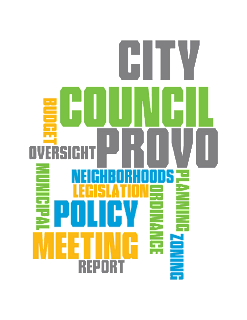 The Council's Policy Governance Committee, in conjunction with Don Jarvis and the City's administration, has created a draft agenda for a proposed zoning summit. This would be sponsored by the Council and would offer speakers and workshops. The target date for this event is December 3, 2015. Council members gave their support of continuing to put this event together. Council members continued their discussion on priorities and have selected "balanced mix of housing" as the first priority to begin focusing on, starting with a discussion in the November 17 Work Meeting. In December, the Council will discuss another priority, "Provo west side development." Discussed proposed changes to Council Committees. Provo City became a sister city with Meissen, Germany, in 2001. Meissen's Mayor and three of its Council Members journeyed to Provo this week to tour the area and learn more about our city. The Mayors and Council Members from both cities ate dinner together before the Council Meeting and then the Mayors re-signed the sister city agreement. We are very grateful to Bruce Van Orden for providing translating services as we welcomed this group to Provo. Meissen is the birthplace of Karl Maeser, one of Provo's founders.